DINNER CHEZ NOUS – Page 36 – Plan, Cook, Eat. Repeat. Dupont Circle Picnic. With Wine. Tonight’s not in the official dinner plans, but walking to work earlier this week, I had noticed a poster advertising a Friday night movie night in Dupont Circle. Done. 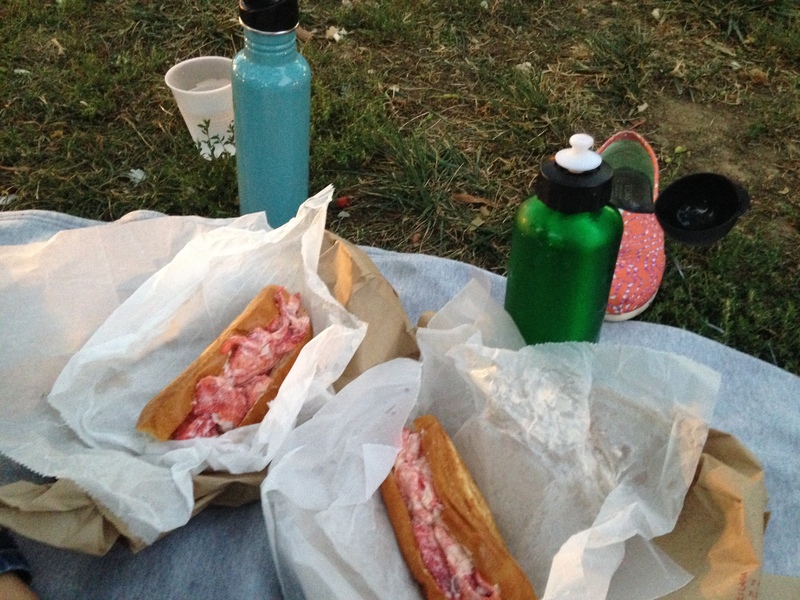 Two Maine-style lobster rolls from Willie T’s Lobster Shack, a bag of Cape Cod potato chips, and two water bottles of wine later, we’re puzzling over the many plot twists of The Maltese Falcon. Confused, but satiated. Posted on September 20, 2014 December 7, 2014 Author varinajCategories restaurantsTags lobster, movie night, picnicLeave a comment on Dupont Circle Picnic. With Wine. The original plan for this week had us eating out tonight with friends, so when we decide to reschedule, I haven’t planned on anything for tonight. With the husband out to dinner with a prospective summer associate (guess the wining and dining days are back), I’m on my own. After hitting the gym, I’m starving, but nothing in the fridge is speaking to me. Time to mix it up. In medium saute pan, I heat some olive oil and add in the ground turkey to heat it through. After a couple of minutes, I crack in two eggs, and a big handful of spinach. Cooking it all through, I add in the fontina at the very end, to let it melt down. Comfort on a plate, with a side of Sriracha. I’m always happy when I can live off “the frost of the land,” also known as the contents of my fridge. I think the takeaway here is not necessarily to repeat this particular “recipe,” but to be unafraid to throw some random things together in a pot and see how it turns out. In this case, not badly! Posted on September 20, 2014 October 17, 2014 Author varinajCategories eggs, turkeyTags frost living, leftoversLeave a comment on Home Alone. I was a truly picky eater when I was a kid. I was a “vegetarian” – which basically meant I ate pasta, butter, cheese and milk. And white bread, sometimes. After an epic trip to Pizza Hut on the great college tour of 2000, all of that changed. Well, some of it. Trying new things, including new restaurants, like Chinese ones, was truly revolutionary. Almost 15 years later, I’m still obsessed with their chicken lettuce wraps…which now, I can make at home in about 20 minutes. Variations are endless; this is what I mixed up for Wednesday night. Heat the olive oil, saute the onions for a few minutes, add the ground meat until mostly brown. Tossed in the rest of the vegetables and let them cook down a bit before tossing in the garlic. Adding the rest of the ingredients (soy sauce, rice wine vinegar, oyster sauce and ginger) and finished with a big squeeze of Srichacha. Tossed briefly with the green onions before serving with washed iceburg lettuce. Bonus: no carbs meant a few extra glasses of wine. This is quickly becoming a staple in our house. Easy (I mean, it’s almost impossible to mess up, unless you add too much soy and it becomes oversalted); quick (20 minutes, tops); relatively healthy (until you add the wine). And you can use the leftovers in a big salad the next day for lunch, as it’s just as good cold. Yum. No planning, no cooking, no cleaning. Just wine, cheese, and maybe some frozen Trader Joe’s snacks. That’s a meal, right? I think it’s traditional to cook fish on Friday, but when you grocery shop on a Sunday, there’s no way you want that salmon sitting around in your fridge that long. That is why, despite coming home late from work today with a full-on case of the Mondays, I forced myself to cook that baby up. Note to self – that’s why planning out the week is so helpful! Cooking Light is a standard go-to for recipe ideas. I generally don’t quite follow them to a “T” – meaning my meals are not always fit to be called “light” – but I do enjoy pretending that I’m cooking healthfully. This one is no exception – heavily inspired by their recipe for Coconut Curry Salmon with Basmati Rice and Snow Peas. Combine the sugar, lime/lemon juice, curry paste and can of coconut milk in a large skillet, heat slightly. Add the fish to the pan and bring it to a simmer. Cover, reduce heat and cook about 10 minutes. Serve over Asian slaw…below. 1. Heated two turns of dark sesame oil in a large saute pan; added the garlic for a minute or two and then the slaw. A few turns with both the soy sauce and the rice vinegar, and then cooked it all down together. The husband makes a big point out of not liking fish, but since I plan, shop for and cook the meals, we’re slowly incorporating more fish into the diet. He cleaned his plate on this one. This was easy, delicious, and relatively fast. A definite keeper, even if next time I skip the soy sauce on the slaw…too salty.